The new B2B event Charter Meetup organized by ICE was successfully held in Athens Avenue Hotel from March 31st to April 2nd, 2017. Fleet operators from Greece met with worldwide charter brokers featuring 460 meetings in 23 organized meeting slots. Therewith, not everything was about discussing cooperation; Greek sailing destinations were thoroughly presented by locals with the focus on arrival options, costs, weather conditions, climate and social factors affecting different island groups. The presentation was followed by a basic overview of each participating charter company who introduced the audience to their bases, fleet and general info. Participants didn’t miss the chance to chat by a glass of wine & canapes on Friday and Saturday evenings when casual gatherings were organized in the Hotel’s restaurant. Sunday was nevertheless our favorite day – visiting Alimos And Lavrio marina for boat viewing turned to be a relaxed guided tour and hang out on a sunny afternoon with amazing food, speedboat excursion and a visit to Poseidon’s temple all accompanied with laughter and positive energy. 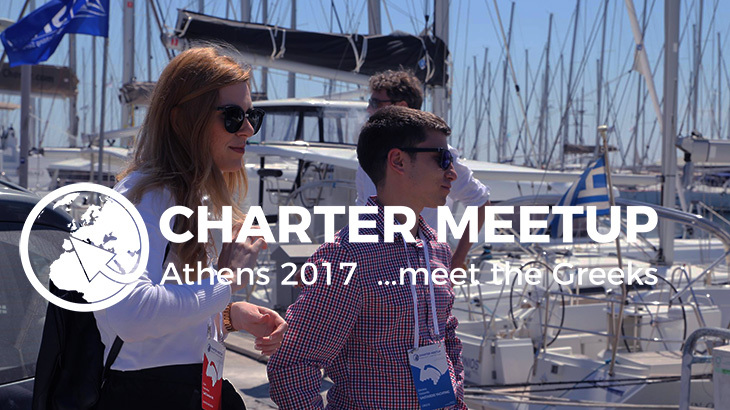 Charter Meetup is planned as an opportunity to strengthen charter weeks in Greece by establishing new business relationships, educating charter brokers about sailing areas and charter bases, but ended up being more than that – a whole new networking model in the yacht charter industry – casual, educational and fun! Many thanks to the Ego Charter crew for the initiative and help.